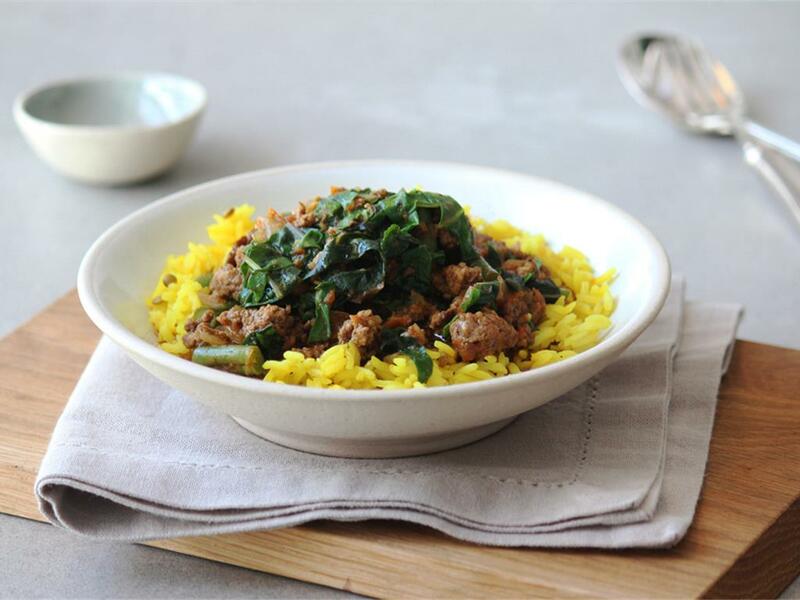 A fragrant & creamy coconut curry with masala, beef and green beans, served with biryani rice. Biryani rice: Place a pot on medium-heat and add the rice. Pour in the boiling water (½ cup) with a pinch of salt and boil gently for 10-12 minutes until cooked, but with a slight bite. Drain. Beef mince: Place a large pan on medium-high heat with a drizzle of olive oil. When hot, add the mince, season with salt and pepper and break apart with a spoon. Cook for 4-5minutes until golden brown. Then remove from the pan, drain, discard the liquid and set aside. Fragrant curry: Using the same pan on medium-high heat, add a drizzle of olive oil and the onion with a pinch of salt and sauté for 5 minutes. Add the garlic, grated tomatoes (with the liquid) and Mother-in-law Curry Powder (spicy, so use to preference) and sauté for 3 minutes to cook the tomato a little. Add the green beans and beef mince, pour in the coconut milk and let it simmer for another 4-5 minutes until the green beans are cooked, but with a slight bite. Mix in the garam masala and cook for another minute. Serve the biryani rice topped with the fragrant curry.